Boulder Focus Center - WHAT IS CONSUMER RESEARCH? What does being on a Boulder Focus Center consumer panel mean? How often may I participate in studies? Members of our panels are consumers who have expressed an interest and a willingness to participate in consumer research studies. Members provide a basic profile of themselves so that they may be matched as candidates for studies. A panel member may be invited to participate in a focus group or take a product home, use it, and give opinions in writing or over the phone. Panel members are usually contacted by phone or email. In most cases members will need to speak with someone at the Boulder Focus Center to determine if they are appropriate candidates for a particular study and if the times the study is being conducted will fit into their schedule. Your information is confidential. Under no circumstances will your name and phone number be sold or passed on to anyone outside of our office. Read our privacy statement. Have you ever been shopping for clothing, or cars, and wondered "Whose idea was it to produce that?" or thought "They should have asked the people who use this stuff what they want." Consumer research � sometimes referred to as Marketing Research � is intended to determine what the end-user (you the consumer) wants in food products, computer products, sports products, and any other retail products and services you can think of. Companies want consumer input during the design (or re-design) phase of products, as well as after the products are on the market. They may want to know what you think about an existing product and how it could be improved. Consumer input is important! As a part of our panel you will have the opportunity to be invited to participate in consumer studies. Your thoughts and opinions will help to shape some of the products that are offered in the retail marketplace. 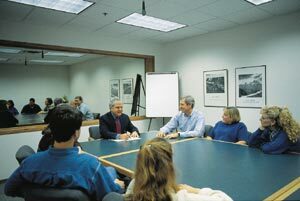 A focus group is a group discussion led by a moderator. It usually lasts 1-2 hours and is focused on a product, an idea, consumer habits or some combination of all three. Organizations use this method of research to obtain free-flowing ideas that wouldn't be possible to express in a written survey. Most people really enjoy being a part of these groups. All thoughts and opinions are kept in strictest confidence. No one is ever asked to purchase anything; in fact, participants are typically thanked with cash or merchandise. The typical "thank you" for a 2-hour discussion is $50.00 to $100.00. Some studies require that participants not have been in a study in the last three months. Some require time to have passed since one's last study, and some only specify that a participant not have been in a study involving their particular industry. There is no certain way to predict how often you will be contacted as a panel member. This is determined by the profiles that are needed by our clients for their studies.